[Stride]-Stride Step-[Choose one or more cards with the sum of their grades being 3 or greater from your hand, and discard them] Stride this card on your (VC) from face down. [ACT](VC)[1/Turn]:[Counter Blast (1)] If you have a heart card with "Witch" in its card name, and your opponent has two or more grade 0 rear-guards, your opponent reveals ten cards from the top of his or her deck, chooses a grade 0 card from among them, rides it as [Stand], shuffles his or her deck, and until end of turn, that unit gets "[AUTO](VC):[Counter Blast (1)] At the beginning of the guard step of the battle that your unit was attacked, you may pay the cost. If you do, choose any number of cards from your hand, and call them to (GC) as [Rest]." and "[AUTO](VC):At the end of the turn, choose up to one card from your soul, and ride it as [Stand].". Trololol Legion trolls this hard. 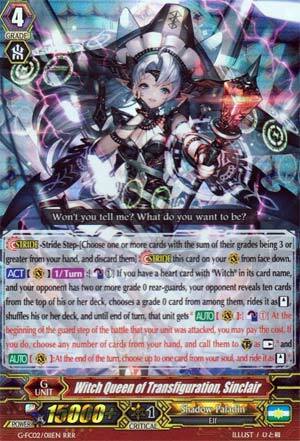 Anyway, Sinclair here needs a Witch heart, but fulfill that requirement, along with the requirement of CB1 when the opponent controls 2 Grade 0 rear-guards, and her ACT skill, once per turn, makes the opponent check the top 10 cards of their deck, and ride a Grade 0 among them. This would normally seal off any guard that isn't Grade 0 for the turn, but Sinclair lets the opponent guard with anything if they pay a cost of CB1 per guard. Then when the turn ends, they choose a card in the soul to ride. So this is a glorified way of forcing more guard out of the opponent with a weak unit as well as make them eat resources per guard. This is killer for decks that are heavy on CB (and I must admit my old Kagero deck fell under this category) but also works nicely as an early means to either get some damage in or destroy hand for cheap. Witches did suffer from a good offense and I'm glad this solves that problem. 4 of copy for Witches. Hello, Stil Vampir, how are you doing? CB1 to force your opponent to reveal the top 10 cards, if they have a Grade 0 there, they ride it as stand and if they want to guard with anything other than Grade 0s, they need to CB1? Yeah, for Witches that's both easy and this is very much needed. Oh, did you burn up all your counter-blasts already? Too bad! Sadly doesn't combo with Securna, then again, that would be too good. At least it gives the Witches something other than Phantom Blaster "Abyss" to run now.